Area : 614 sq. km. A mosaic of grasslands, marshes, lakes and sal (Shorea robusta) forests constitute the Dudhwa Tiger Reserve. It is as wild as can be. 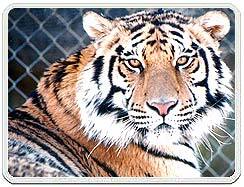 Situated on the Indo-Nepal border in District Lakhimpur-Kheri of Uttar Pradesh, the Dudhwa Tiger Reserve with an area of 614 sq. km. is one of the finest of the few remaining examples of the exceedingly diverse and productive Terai eco-systems. The northern edge of the Reserve lies along the Indo-Nepal border and the southern boundary is marked by the River Suheli. It is home to a large number of rare and endangered species which include tiger, leopard, swamp deer, hispid hare, Bengal flovican, etc. The Kishanpur Sanctuary located about 30 km. from Dudwa, is the other constituent of the Reserve. Spread over-about 200-sq. 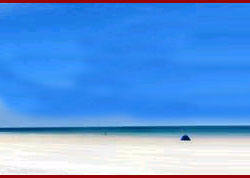 km., it lies on the banks of the River Sharda and is surrounded by sal forests of the adjoining reserved forests. The grasslands of the Reserve is the habitat of the largest kind of Indian deer - the swamp deer or the 'barasingha', so called because of their magnificent antlers (bara- twelve; singha-antler). Decline in their habitats led to a drastic decline in numbers and a small area named Sonaripur Sanctuary was set aside in 1958 for the conservation of this rare species of deer. In an exciting experiment, one male and five female rhinos were relocated here from Assam and Nepal, in 1985. Now well settled in Dudwa, their numbers have increased. At present, tourists are not allowed in the rhino area. The Reserve has also a fair density of tigers. Standing as it does at the top of the food chain, the tiger can only be protected by the total conservation of its natural environment and the Project Tiger has reinforced this at Dudwa. Despite its numbers, sightings of the tiger are rare, due to the dense nature of the forest cover. The hispid hare, a dark brown animal with bristly fur - last seen in the area in 1951 and believed to have become extinct, was rediscovered in 1984 to the great interest of conservationists. The short -nosed crocodile - the 'mugger' and otters can be seen along the riverbanks as weII as pythons and monitor lizards. Jeeps and mini buses can be hired from the Park. Elephant rides through the Park are also available. 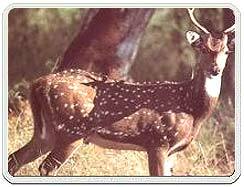 Tiger, swamp deer, hog deer, barking deer, sambar, wild boar, sloth bear, rhesus monkey, langur, crocodile, jackal, leopard etc. Resident birds include hornbills, jungle fowl, peafowl, partridges, woodpeckers, thrushes, orioles, bee-eaters, baya, minivets, roller, drongos, bulbuls, etc. Rivers, nalas and ponds which comprise roughly 2% of the Reserve area attract birds like clucks, geese, cormorants, ibis, herons, storks, kites, fishing eagles, etc. By Train : From Delhi: Delhi-Bareilly-Shahjahanpur (301 km., N.R.) and then by road to Dudwa (107 km.). By Road : From Delhi : Delhi-Moradabad-Bareilly- Pilibhit (or Shahjahanpur)- Khutar-Mailani-Bhira-Palia- Dudwa. (420 km. to 430 km. approx.). UPSRTC and private bus services link Palia to Lakhimpur Kheri, Shahjahanpur, Bareilly, Delhi etc. Buses ply frequently between Palia and Dudwa.